Have you ever had one of those days (or months) when you’re so flipping busy that you wonder when the heck you’re going to have time to eat, and you can’t even think about cooking? That’s what life has been like ever since we got back from a long trip to Maui and Oahu (and speaking of that, sorry for my delay in posting!) Rather than eating a bowl of popcorn for dinner (as one of my cooking-impaired friends suggested, and for whom I’m now watching for signs of scurvy), or ordering take-out (as my converting carnivore has offered – he usually manages to slip in an order of something meat-based which he always thinks will go undetected, but never does), I developed a super tasty vegan dish that takes only 10 minutes to make: Thai Soft Tacos. The rich flavor of peanut satay sauce, the crunch of the fake chicken tenders and the lovely tang of Thai sweet chili sauce pair beautifully together. And the secret ingredient – finely chopped fresh lime, including little bits of the peel – adds just the right amount of sharpness, acidity and a hint of bitterness to make the flavors burst to life on your tongue. Every bite offers an intriguingly complex mix of textures and tastes. When I have time, I prefer to make meals from scratch, but when that can’t happen, this is my go-to dish. John likes these Thai Tacos so much that now he asks for them a couple times per week, and he gives it his highest veg praise ever: “Oh my God, this is so good that it doesn’t even need meat!” (And cue Cimeron’s eyes lighting up with glee.) That testimonial, coupled with the incredibly low “f*$&ck with it factor” has earned this dish a permanent place on our rotation. Give it a try! After your first crunchy, flavor-packed bite, you’ll probably want to make these tacos every night this week, even if you have time to cook something more elaborate. Enjoy! Heat oven to 450. Microwave the Gardein Crisp Tenders for 45 seconds. Then place them on a baking dish, spray with olive oil and bake for 10 minutes. (Or if you’re super tight on time, nuke them for 1.5 minutes, spray them with oil and broil them for a couple minutes per side until crispy.) When ready, slice them lengthwise into 3 pieces. Meanwhile, chop up all the fixins and prepare the assembly line. 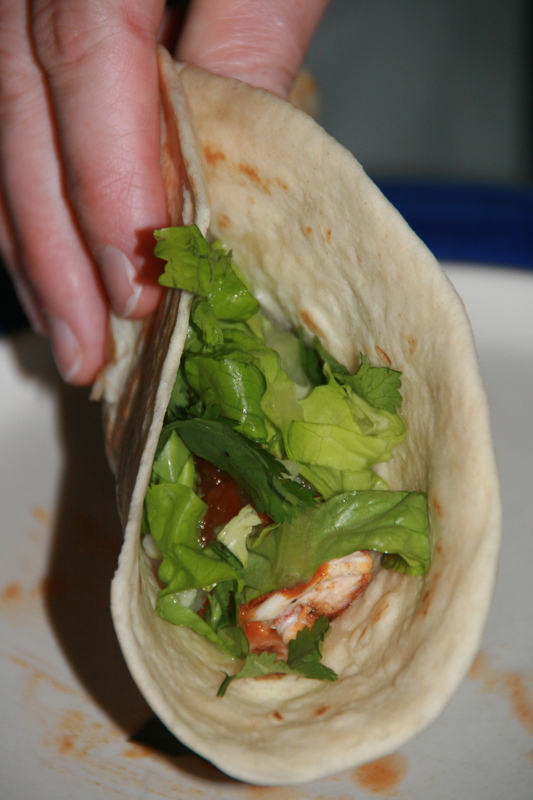 Spread a spoonful of the peanut satay sauce down the middle of the tortilla. 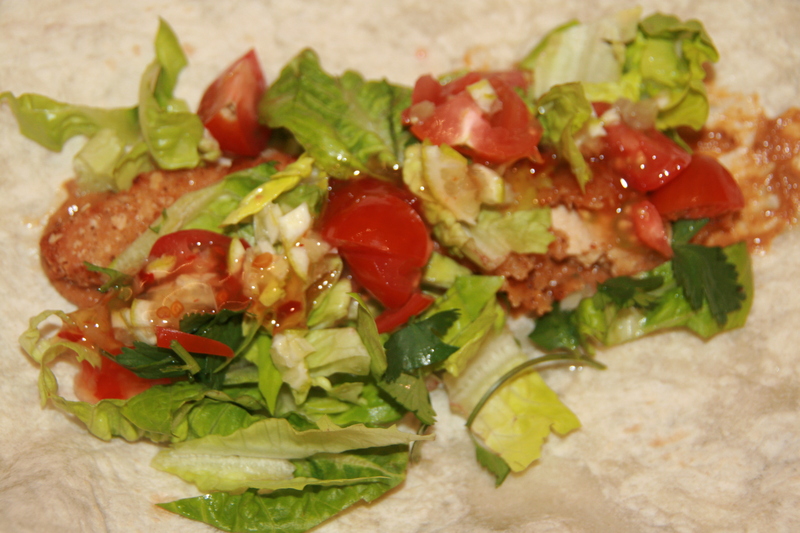 Lay down 2-3 of the sliced pieces of Crisp Tenders, then top with some lettuce, tomato and cilantro. Evenly sprinkle with bits of the lime. Then drizzle on some Thai sweet chili sauce to taste. Then prepare your taste buds to be very happy! This sounds awesome! I think even Molly and Bill will enjoy this! I think they will, Trish! It’s *really* tasty. I mean, who doesn’t like peanut satay sauce and Thai sweet chili sauce? We can’t get enough of it!